Another week, another collection of fine performances by Avid Sport’s riders. Harry Tucker and Team Crowther (Colette, Isobel, Sarah and Chris) were in action at the Sulis Scorpions Club Hill climb at Burrington Combe. Harry stormed to the win, beating Chris out into second place with the only sub 10 minute times of the day (8:37 and 9:59 respectively). Sarah was fastest senior female with a time of 14:24, setting off just behind the Sulis Scorpions girls who put on a fantastic race – Ellie Wallbaum (13:55) claiming the club honours from Josie Vallis (15:04) Isobel and Colette (15:18 and 15:56). 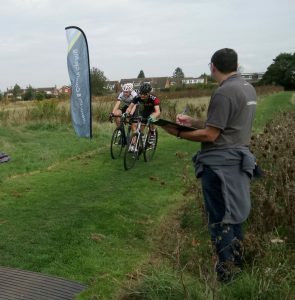 Great racing by all and thank you to Somer Valley CC and the Sulis Scorpions for putting on such a great event! Following a recent visit to Cheltenham for the Tour of Britain support races with the Cheltenham Tewksbury and Winchcombe Wheelers (CTW), we found ourselves back at Pittville Park, for Round 4 of the Western League Winter CX. From last year the sign on had been moved to the edge of the car park; which this year made for a smooth transition from car park to race field, via the sign on. Within minutes the sign on process was complete. Jenson had his timing chip and race number and headed out for a recce before the under 12s started. The course was mud free due to the recent warm, dry spells and though technical in places; would make for a fast lap. The under 12s race was completed with some great close racing at the front with Elen Ruck from the Sulis Scorpions taking the win; with Chloe from Tri Team Glos taking a close 2nd. This was a reversal of fortunes from ShamXross the previous week, where Chloe took the win over Elen. This looks to be a pair of riders worth keeping an eye on; as both riders appear to be very closely matched on both ability and determination. 11am was soon upon us and the u14 & u16 Youth riders were assembled for their mandatory keep it clean and no swearing brief. A briefing that some of the adult riders should, perhaps, take note of? Following a short countdown, the race started and with high energy; the pedals began to spin. As per the form book, Henry Johnson from Cheltenham & County CC was out front with Josh Mitchell from the Midlands in hot pursuit. The first lap would see Henry drop quite a few places due to an uncharacteristic crash; involving a tree. This bunched the chasing group and the race was well and truly on! 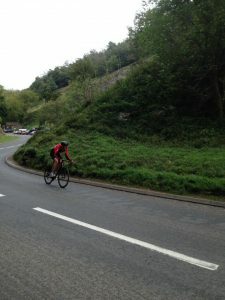 Henry kept his composure and before not too long was back in contention with the lead group. As the race unfolded, Henry and Josh were clearly on the front with Jacob Hardy (Cheltenham & County CC) on the chase. Fourth and Fifth place was occupied by Bryn Ruck of BCDS and Jenson Harris of Avid Sport. With strength triumphing over experience, the order would remain as this until BCDS rider Bryn unfortunately threw a chain, whilst traversing the hurdles. Seeing the opportunity, Avid rider, Jenson Harris powered past in an attempt to make the most of Bryn’s misfortune. After all… this is racing! Having quickly rectified the thrown chain, Bryn was having none of it and was soon back in the saddle to chase down the small gap to Jenson. Before not too long Bryn and Jenson were back together, riding the same patch of grass; as were Henry and Josh further up the line, with Jacob Hardy still sitting comfortably between the two pairs, all be it by a gap. The order would remain as this until the final lap. The bell sounded as Henry and Josh crossed the line in tandem; with Josh taking the position of ‘stoker’. Now the time had come for riders to hatch whatever final plan they had been crafting during the race. Standing from the ‘pits-ville’ (do you see what I did there?) it’s never easy to see all of what goes on but; with the layout of the Pittville course I did have a good view of the riders crossing the infield as they headed to that all important final corner. Who would be on the front as they came back into view and would it go down to a final sprint? First back into view would be Henry Johnson; with a clear gap to Josh Mitchell in 2nd and Jacob Hardy in 3rd. After a small gap – Bryn and Jenson were battling over 4th and 5th. At this point, crashing aside; 1st, 2nd & 3rd was a done deal and the battle for 4th and 5th would be decided with a finish line sprint. The end of the race for the overall podium was uninterrupted and finished without incident; with Henry taking the win by 21 seconds from Josh; and Jacob following 13 seconds behind in 3rd. The fight for 4th was probably the closest yet of this season. Local rider Finn Searle of Salt & Sham, crossed the line in 8th place with the top female rider, Ella Shaftoe crossing the line line in 9th position. A special mention mention to BCDS rider, Jakob Hudson who despite a puncture; finished in 10th place by shouldering his bike over the line. A big thank you to Cheltenham & County CC for a fab day of racing.